The Vandy Vape GOVAD RTA is a two post clamp style build deck with spring loaded clamps, measuring at 26mm for the outside diameter and 23.7mm for the base diameter, and is capable of holding 2 to 4ml of e-juice. The GOVAD RTA includes a removable tank capacity reducer that allows the RTA to be TPD compliant by holding 2ml of E-Liquid instead of 4ml and is filled via a top fill system. 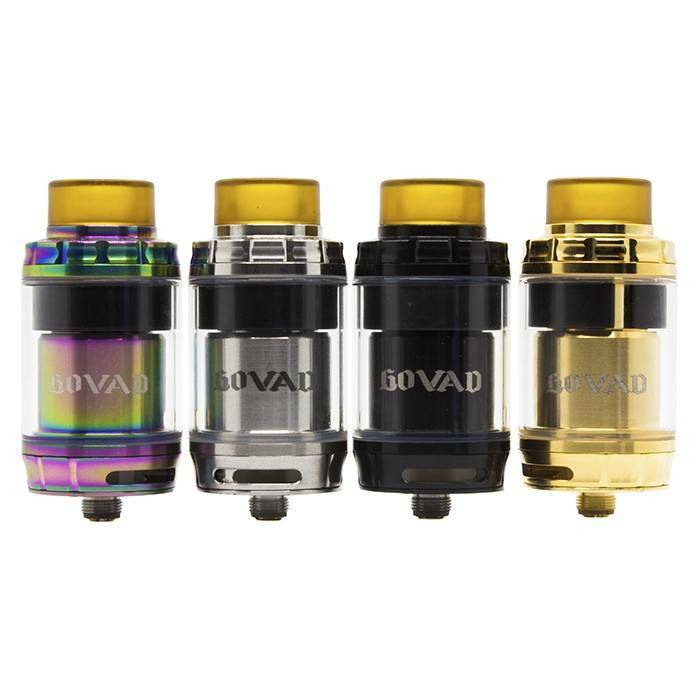 The GOVAD RTA features three dimensional side airslots and two bottom air holes for better airflow capability, alongside a dual adjustable bottom airflow control with each airslot measuring at 14mm by 2mm and can be fully closed. Included with the GOVAD RTA are two 810 drip tips: a 12mm ULTEM drip tip and an 11mm delrin drip tip, and a 510 drip tip adapter allowing for more drip tip versatility. With its beautiful construction and smooth airflow system, the Vandy Vape GOVAD RTA is a top choice for the RTA seeker!